The two Muslim women in headscarves pull out weeds from between chardonnay vines at a vineyard in north eastern Tunisia. They say that their faith is no barrier to doing their job. "What else can we do? There is no other work," says one of the women. "We don't drink in our family," adds her friend. "But everyone should decide for themselves." The two women continue to tend the rows of budding vines under a bright blue sky. But this picturesque scene is sadly no longer the sort of image that springs to mind at the mention of Tunisia. The north African country has instead been the focus of attention recently following the deadly attack on holidaymakers in the seaside resort of Port El Kantaoui, near the city of Sousse, on 26 June. In the attack, for which the Islamic State group claimed responsibility, a gunman opened fire on a beach and at a hotel killing 38 tourists. With foreign governments now advising against travelling to Tunisia, the country's tourism sector - a vital part of its economy - faces an uncertain future. Yet while the Tunisian holiday industry will inevitably be most affected by the fear of further Islamist violence, and the knock-on big reduction in tourist numbers, the country's wine producers are also now increasingly nervous. Although it may seem odd to some that a Muslim country like Tunisia has a wine industry, given that alcohol is generally considered to be forbidden under Islam, the drink has been made in the country since before Roman times. And while production diminished after the introduction of Islam in the 7th Century, it never completely stopped. Under French rule between 1881 and 1956 it increased substantially. Following the departure of French winemakers, and the nationalisation of the industry, the sector saw decades of decline. However, some Tunisians still to this day discreetly enjoy a glass or two of wine, especially in the north of the country. Wine is available for them to buy in large supermarkets, with the only restriction that it cannot be bought on Fridays, the Islamic holy day, or during the month of Ramadan, which this year is due to end this weekend. And in the past decade, the quality of Tunisian wine has increased greatly. The state-run monopoly on production has been removed, clearing the way for the establishment of more than 10 ambitious privately-owned wineries. Last year industry figures estimate that Tunisians drank 14.3 million bottles of the country's wine, only slightly fewer than the 14.4 million bottles consumed by visiting tourists. But with foreign holidaymakers now staying away, the country's winemakers may be left with a lot of unsold wine on their hands. And there is fear that Islamist extremists may turn their attention to the industry. One Tunisian winemaker asked not to be quoted in this article, saying that the authorities had advised caution, and that he had to be discreet because of security concerns. But others remain upbeat and open. Among the rolling hills, olive groves and fruit trees of the Cap Bon region in north eastern Tunisia - the centre of the country's wine industry - lies the winery Domaine Neferis. "Since there are now more competitors, the quality has increased," says Samia Ben Ali, showing the oak barrels in which her red wine matures. The 39-year-old, who learned the trade from visiting Australian winemakers, is currently the only female Tunisian winemaker. "My work is my passion," she says. "Not many people get to do what they want." Despite being often warned not to talk to the media, Ms Ben Ali says: "I think it's important to let the rest of the world see that women in Tunisia can do the work they want to do." She adds that drinking wine is certainly not taboo in her family. "I come from the Kerkennah Islands [which lie off Tunisia's eastern coast], where people have been making wine at home for centuries." When the moderate Islamic party Ennahda came to power in Tunisia after the 2011 revolution, there was an initial fear that alcohol would be banned. Instead the government only increased the tax on alcoholic drinks, and this had no impact on sales. And in last year's general election Ennahda was replaced by the secular Nidaa Tounes party. At the nearby winery, Societe Ceptunes, winemaker Yacine Amami pours a glass of white wine. The 43-year-old, who has a Tunisian father and a German mother, says that wine will always be popular in some quarters of the country. "Throughout the history of mankind, people have wanted to drink," he says. A few hours drive to the west, past golden wheat fields and flocks of sheep, another woman is working in the Tunisian wine industry. Pilar Rodrigo Monzon, a 49-year-old Spaniard, is the owner of a winery called Domaine Shadrapa. After previously working for Tunisia's former state-run wine company, Les Vignerons de Carthage, she took over the then run down Shadrapa site nine years ago. Many years previously it had been owned by a Frenchman who left the country when Tunisia gained independence. Ms Monzon says the picturesque hilly landscape is an excellent spot to grow grapes. "The French chose a good place for the wine industry here," she says. With foreign tourists staying away, many Tunisian winemakers are now hoping to sell more of their wine abroad. With exports in 2013 only totalling two million bottles, there is much scope for growth. 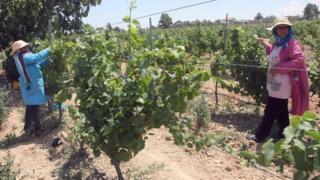 However, French-Dutch wine expert Christian Callec says Tunisia may find it difficult to greatly increase this number. "It's difficult to convince people to buy Tunisian wine when there are already so many other wines in the world," he says. "There is [also] no money to do large-scale promotions and compete with the aggressive campaigns from other countries." Ms Ben Ali agrees that "it's difficult to compete with cheap wines from Californian, Chile and South Africa". Yet while Tunisian winemakers may have longer term concerns, most are now looking forward to this weekend's festival of Eid al-Fitr, which will mark the end of the fasting month of Ramadan. Many Tunisians include drinking wine in their Eid celebration, so much so that wine sales are typically double that of normal times of the year.